Southern Africa is home to incredible diversity in scenery and habitats. I fell in love with this area when I visited in January and met some inspiring people. I want YOU to experience this area from a new perspective and I’m excited to share that I’ve partnered with an amazing team to make it happen. Talk about perspective. When you stand beneath a 6 ton elephant you feel pretty insignificant. This gentle giant, Tembo, is a 35 year old male that weighs 6 tons and has 10 more years of growth. He’s an ambassador for protecting his species. I feel honored and privileged to have been in his presence. 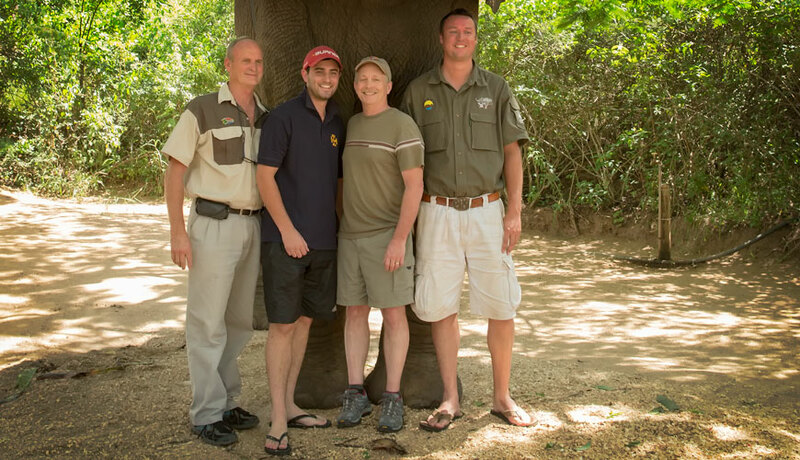 Pictured from left to right… Our pilot Will, legal advice comes from Rob, photographer Mr. Berry, and expert guide and tracker Shaun. I am avid supporter of organizations like, Elephant Whisperers, for the work they’re doing. On all my tours I like to visit organizations to better educate my guests and give back to the local businesses that are working to preserve and protect. Thanks to the efforts of my amazing team, I have a new a NEW tour, “Southern Africa By Air”. Witness 3 magnificent Southern African countries from land and by AIR! We start with a visit to the Okavango Delta in Botswana teeming with wildlife and known for its open savannahs, flowing rivers, and crystal clear lagoons. For those who follow Beverly and Dereck Joubert this is where they’ve filmed many of their documentaries seen on National Geographic. Next stop is Namibia, home of the oldest “living” desert, Namib Desert, and Sossusvlei, the highest sand dunes in the world exceeding 1000 feet. While there we will also visit the coastal resort town of Swakopmund and capital city of Windhoek. The last part of our journey will be in the Klaserie Private Nature Reserve within Kruger National Park (where I captured the photographs used in my article “The Elusive Leopard” published in the Klaserie Chronicle.) Here we’ll have a luxury private lodge to ourselves including a private guide for both day and night game viewing. I would love to share this experience with you. Find out more about our Southern Africa by Air tour. « Is Travel Insurance Worth It?